Are you eligible for an IVA? In an IVA, a single, affordable monthly payment is agreed upon. This is then divided among the unsecured creditors included within the arrangement. These payments are usually made for five years. This means once you enter into one, creditors can take no further action against you, and cannot contact you directly. Be a resident in England or Wales. Have a steady income which will allow you to make consistent monthly payments of at least £85 per month. The above criteria is set by Creditfix and may not be the same for all IVA providers. It is possible for a couple to set up two individual voluntary arrangements that are administered as one, once they have been accepted by creditors. This will allow the household to make one affordable repayment to all creditors through the IVAs. Any joint debts will be included within both arrangements. In some cases, it may be that an individual wants to offer a one off payment to their creditors as a full and final settlement. If you have sufficient savings, are in the process of selling an asset which will release funds for your unsecured creditors. You may also have a family member or friend who is prepared to provide funds, you may be able to enter into what is known as a ‘Full and Final IVA. In this type of IVA, you make one, large payment to creditors rather than ongoing monthly payments. An insolvency practitioner can advise as to whether this solution is suitable for you. The IVA Protocol is a standard framework for dealing with straightforward consumer IVAs and applies to both IVA providers and creditors. By accepting the content of the protocol, IVA providers and creditors agree to follow the processes and agreed documentation that forms part of it. IVA providers indicate their acceptance of the content of the protocol by drawing up a proposal based on the standard documentation, and which states that it follows the protocol. Creditors are expected to abide by the terms of the protocol in relation to proposals drawn up on that basis. Following these guidelines is voluntary, and they were designed to encourage consistent good practice across the industry. Most creditors have agreed to abide by the protocol and this has made the process of proposing and administering IVAs much simpler. Setting up and supervising an IVA incurs fees, since the insolvency practitioner responsible needs to be paid for their services. Some practitioners ask for upfront fees to be paid but generally these are paid out of your monthly repayments. 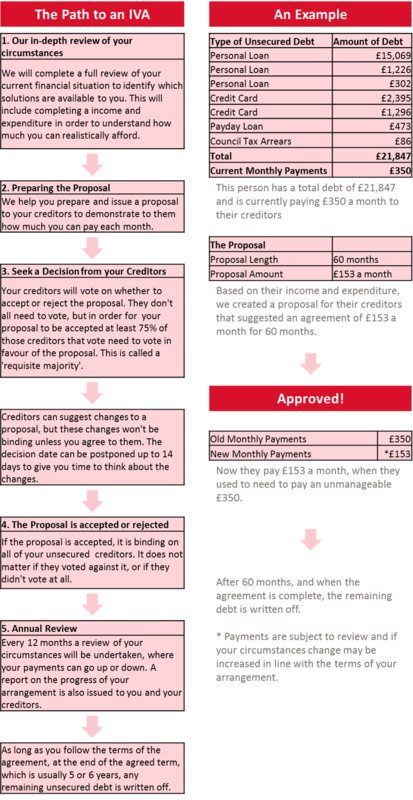 Creditfix will never ask for upfront fees before proposing your IVA to your creditors. Here at Creditfix we will only charge fees if an IVA is subsequently approved by your creditors and our fees are only taken from your monthly payments or asset realisations paid into your arrangement. We also offer, as part of your proposal, to start distributing a percentage of the payments made by you from as early as month 3, which means the balances owed to your creditors are reduced from the outset of your arrangement. Most other practitioners only start distributing funds to creditors once the Nominee Fee and Disbursements have been paid in full which could be as long as month 18 of your arrangement. In some cases, creditors amend the terms of the IVA so that we are not required to make payments to them from month three. In an IVA there are three different types of cost charged by the Insolvency Practitioner. This fee covers the setting up and preparation of your IVA proposal. This includes assessing your current financial situation and your repayment offer to creditors, issuing the Proposal to your creditors. Also, the administration and facilitation of the creditors’ decision process used to consider the IVA, and any negotiations with creditors during this process. These fees are charged for the ongoing administration of the IVA which includes collecting and distributing your monthly repayments. This includes dealing with any queries raised by you or your creditors, completing an annual review of your financial circumstances, reporting annually to you and your creditors about the progress of the IVA, and dealing with the closing formalities. The Supervisor’s fee is generally based on a percentage of any monies paid into the arrangement and ranges from 15 – 20% of the payments made. In some cases a flat fee may be charged. These are costs paid by the IP to third party companies for software licences, insurances, and registrations that are required as part of the arrangement. These may also include payments made for the provision of additional services to provide the best return for your creditors. Typically the costs of the arrangement equate to around £1,200 per case. Bankruptcy and IVAs are both formal insolvency solutions which result in all, or part, of your unsecured debts being written off, so it can be tricky to know which is right for you. However, there are a number of key differences which could help you to decide. In an IVA, you remain in control of your assets, unlike with bankruptcy, which transfers control of your assets to the Official Receiver or Trustee. An IVA allows you far greater control over your assets. For example, if you own your home and there is equity available in it, this would almost certainly be sold during the bankruptcy process and all available equity paid into the bankruptcy. With an IVA you would be allowed to keep your home, although you will be required to attempt to remortgage it during the final year of the arrangement to release an element (but not all) of the equity. Going through bankruptcy may also mean you have to sell your vehicles, unless they are essential or very low-value. In an IVA, you allowed to retain your vehicles. With bankruptcy, your bank accounts are likely to be frozen. This doesn’t generally happen with an IVA providing you have no unsecured debt with your current bank account provider, if you do then you may need to change banks before the IVA is proposed. Both bankruptcy and IVAs can affect certain careers, but bankruptcy usually incurs more severe consequences. Insolvency may affect jobs in law, property, finance, or accountancy. Check your terms of employment if you are unsure whether your employment will be affected. IVAs are more flexible than bankruptcy, allowing for payment breaks and adjustments should your circumstances change. In bankruptcy if you are required to make payments this would be for a maximum of 3 years rather than 5 / 6 years with an IVA. Bankruptcy allows you to write off debt sooner- the process takes 12 months to three years compared to the five or six years it would take with an IVA. With both processes, all remaining unsecured debt is written off upon completion, and creditors can no longer legally contact you. Unlike IVAs, DMPs are not legally binding on your creditors. Once you enter into one, creditors are not obliged to stick to the terms. Creditors can still contact you during the DMP. DMPs are not recorded on the Insolvency Register, unlike IVAs. There is no minimum amount of debt required to begin a DMP. Unlike with IVAs, creditors are not obliged to freeze interest and fees in DMPs. You will usually repay the full amount of your debt with a DMP, whereas in an IVA the outstanding balance owing to unsecured creditors at the completion of the arrangement is written off. DMPs are more flexible in that you can reduce / increase your repayments as and when required providing creditors accept any revised offers. A DMP may take longer as you are required to pay back the outstanding debt in full and there is no requirement for your creditors to freeze ongoing interest and charges. Being in a DMP does not restrict your ability to apply for further credit, unlike IVAs. Whilst a DMP in not registered on your credit file, creditors may update their accounts to show that repayments are being made through a DMP. As you will almost certainly be making reduced payments to your creditors they may update your file to show that partial payments are being made. A creditor may apply a default to your account and this will remain on your file for 6 years. If you satisfy the default it will be shown as satisfied on your credit file, however it will not be removed until the 6 years has expired. It is easy to feel confused by the process of getting an IVA. We’ve created a helpful flowchart to explain each step. The process is coordinated by an insolvency practitioner who will present a proposal of manageable monthly payments to your creditors. They can then choose to accept or reject the proposal. Having an IVA means that you are making an agreed monthly contribution to your insolvency practitioner who distributes this to your creditors after deducting their fees. Your creditors should stop contacting you as they are now dealing solely with the Insolvency Practitioner. Your role is to pay your contributions on time, to submit the necessary documentation for an annual review of your circumstances and to keep the Insolvency Practitioner up-to-date with your situation. Once a year, you will be required to submit documentation, such as your payslips and bank statements, as part of a review of your financial situation. This may affect the amount that you pay into your IVA as your payments can go up or down. If your financial circumstances change, you must tell your insolvency practitioner, so that they can review your arrangement and see if any changes need to be applied. If in doubt, call your IVA provider and ask. It is likely that they will find out everything in the annual Review, so the sooner they know, the better. You don’t want to risk owing a large, unexpected sum or for the arrangement to fail. If you discover you have a creditor who you did not know about or had forgotten about, then you must tell your IVA provider immediately. They are automatically included in your IVA as it legally binds all unsecured creditors. They will be asked to provide evidence of their debt and once this has been agreed they will receive some of your monthly payments, just as your other creditors do. If they do not like the agreement then they have 28 days from the day they find out about the IVA to challenge it. If the inclusion of this debt exceeds 15% of the total value of the creditors originally included in your proposal then a decision of your creditors will need to be requested to see if the arrangement can continue. If you don’t think you owe the ‘unknown creditor’, tell your Insolvency Practitioner that you want to challenge it. Missing a payment can be risky, so it is advised that you keep your practitioner up-to-date with your financial situation. If you do miss a payment, contact your IVA provider as soon as possible to rearrange payment. They could accept a late payment if you have a good reason. If you don’t contact them, then they will start to chase you for the outstanding payments and report this to your creditors. Once you have missed 3 payments or the cash equivalent to 3 payments they will send you a ‘notice of breach’. Generally, you have between one and three months to correct any problems by explaining the missed payments and paying as soon as possible. Once you do this, no more action will be taken against you. If you cannot manage this, talk to your practitioner as they may be able to change the terms of your arrangement. However, they may also simply terminate your IVA, or apply to the court to make you bankrupt. The sooner you inform your provider, the more likely they are to be able to help. If you have lost your job or you are on maternity leave you can request a payment break of up to 9 months over 5 years without the need to involve your creditors, depending on the nature of the request. Missed months resulting from a payment break would need to be paid before your arrangement can be completed; generally by an extension of the term. Your insolvency practitioner could lower your monthly IVA costs, but this is only possible with the consent of your creditors unless a reduction of less than 15% of your original contribution is required. If it is not possible to lower your monthly payments and you cannot afford them, then your IVA may fail. It is possible to cancel your IVA before it finishes, but this is not something that should be done lightly. Talk to your practitioner about your circumstance first, and they may be able to help you with whatever problem you are having. Organise repayment of your debts to each of your creditors. You will still owe them the remaining amount. Your debts are not written off if your IVA is ended early. Pay your IVA provider for the service they had provided thus far. Your practitioner or your creditors could now chose to make you bankrupt. If your creditors do this, they no longer need to serve you with a ‘statutory demand’ to warn you of their intentions as a failed IVA is sufficient grounds. To avoid bankruptcy, the best thing to do is to contact all of your creditors as soon as possible after your IVA fails, and negotiate repayment directly. Entering into an IVA can seem daunting, and there is plenty to consider when deciding if it is your best option. Here are the main ways that an IVA might affect your life on a day-to-day basis. If you are self-employed, being selected for a contract with the government or council will also require financial checks In most jobs, it is not necessary to inform your employer of your IVA. They will not find out unless they specifically search for you on the insolvency register. A few jobs might require you to make your employer aware of the IVA, however, rarely will one prevent you from working in your current position. Whether or not you are required to tell your employer about your IVA can be found in your contract of employment. You can also continue to operate a business whilst in an IVA, however, ongoing credit may be an issue with suppliers. If you own your own home then this will be taken into consideration when you apply for an IVA. The Insolvency Practitioner will take into consideration, the amount of equity available to you if you were to sell your home and pay off your mortgage. They would see if this amount would be sufficient to repay your debts in full and what attempts you might have made or consideration you have given to this option. All properties are generally included within an IVA unless there are special circumstances. This means that your share of the equity in the property will be reviewed in the final year of your arrangement. A further valuation will be undertaken and up to date mortgage / secured loan balances will be requested to establish the equity available in your property. If your share of the equity available is £5,000 or more, you will be asked to attempt to remortgage your home and put 85% of the available equity into your IVA. However, there are certain provisions contained within the IVA protocol that are applied when looking at a remortgage. You would not be expected to sell your home. If you are unable to remortgage your property then your arrangement may be extended for up to 12 months. You would not be expected to sell your home in an IVA unless you specifically offered to do so as part of your original proposal. When entering into an IVA, you ultimately retain control over your possessions. All assets of value are detailed within your proposal but you can decide which assets to include or exclude from the arrangement. However, your IP will advise you of the likely attitude of your creditors to the exclusion of any of those assets. If you propose to exclude an asset from your arrangement, creditors may request the sale of them, although your agreement to this is required. All household goods and domestic goods are excluded from your arrangement by law. This information will help the practitioner and your creditors to make an informed decision as to what payments you can afford. An IVA allows you far greater control over your money than bankruptcy would, including any savings and pensions you hold. Your bank and the company you owe money to are owned by the same umbrella company. This is because the bank may exercise their ‘right to offset’ by automatically taking payment towards your debt from your account, which could leave you struggling to meet you essential living costs. Switching your account protects you from this happening. Any savings which you have need to be included in your IVA. If your savings are substantial, you might consider the ‘lump sum’ IVA described above, and pay off your debts in a much shorter period of time. Pensions, including state pensions, are also taken into account when your IVA payments are being calculated. If you are paying into a personal pension, creditors may ask you to stop doing so for the duration of an IVA, and pay the amount to them instead. If you are over 55 and have a ‘defined contribution’ pension, which you have not started taking money from yet, your creditors will not expect you to use it towards an IVA, though you might choose to do so. Since IVAs are a formal solution, they are entered on the Insolvency Register, which is a public record, openly accessible online. In cases where there is a threat of violence, the individual’s address can be removed from the register. A record of your IVA remains on the register for three months after it has been completed or terminated. Following this, it is removed. Your IVA will be registered on the Insolvency Register and on your credit reference file, therefore taking out further credit will be more difficult. Creditors will be able to see this entry and may charge you higher interest rates, or deny the credit altogether. The IVA remains on your credit file for 6 years from the date of approval but will be shown as satisfied if the IVA is completed successfully within this period. Once the IVA is completed you are free to apply for credit and start to repair your credit file. You need written permission from your insolvency practitioner to get a loan of more than £500, unless it is for public services such as utilities. In the unlikely event that the worst should happen and you should pass away before completing your IVA, your loved ones should not be affected. With the exception of joint debts and any guarantors of your debt, your spouse, children or other relatives are not expected to pay off your debts. However shared assets, such as houses, could be at risk from creditors who may make claims on the estate. Your next of kin will be required to send a copy of the death certificate to the IVA provider, who will advise you of the next course of action. No upfront fees are charged for setting up the IVA. If your IVA is approved, creditors who vote against your proposal or who do not vote at all are still bound by it. Creditors whose lending is unsecured can’t take any further action against you once the IVA is approved. Once the IVA is approved, interest and charges are frozen by law provided you keep up your payments. Your insolvency practitioner will help you prepare your proposal, including agreeing the level of your household and personal spending based on guidelines acceptable to creditors. You make only a single payment each month. Your insolvency practitioner is responsible for administering and distributing your payments. If your circumstances change for the worse, the IP can in certain circumstances authorise a payment break or go back to creditors and ask them to vary the terms of the arrangement. You will never be forced to sell your home in an IVA. On successful completion of the IVA, the balance of what you owe your unsecured creditors included within the IVA is written off. During the term of the IVA there are restrictions placed on your expenditure. Not all debts can be included in an IVA, for example student loans, child support and maintenance, magistrate court fines and social fund loans are excluded from an IVA, but an allowance can be given to enable you to continue repaying these. Creditors may not approve your IVA. If you are a homeowner you may be required to release equity in the final year of the IVA through remortgaging. If you are unable to remortgage then your arrangement could be extended for up to 12 months in lieu of the equity available in your property. If you become entitled to any windfalls or inheritance over and above £500 during the term of the IVA these funds are to be introduced into the arrangement. If you fail to make the payments due under the terms of your IVA, then your arrangement could fail.If your circumstances change, the IP can ask creditors to agree an amended offer, however if creditors refuse to accept amended terms, the IVA may fail. You may then still owe your creditors the amount that you owed at the outset of the IVA.If your IVA fails, the it could lead to you being made bankrupt.IVA’s are recorded on the Insolvency Register, which is a public register. An IVA remains on your credit file for 6 years after it is accepted, and may have a negative effect on your credit score for up to six years after the IVA is accepted.